I finished priming the bare wood in the mudroom. I then got all of the floor pieces I had laid out last night (Tim was very surprised) picked up and put into piles. 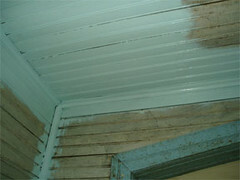 The picture is of about how far I got with the first coat of paint in the beadboard part of the mudroom. The color looks white in the photo, but is actually a dusty baby blue color. It dries a lot darker than it goes on. The color is the same that we used in the hallway to the mudroom- La Fonda Mirage. This is a pretty hard job. I knew it was going to be bad, that's why I've been putting it off for so long. It takes a lot of elbow grease to get the paint into the grooves, but not too much paint into the grooves. After this room I only have the downstairs bathroom and dining room to paint. Of course there's the up-dates on the exterior that need to be done too, but I'm really starting to lean towards hiring the guy who painted the house to come back and do those. I'm just starting to really get burnt out on painting. Tim sent an e-mail to the guy who fixed our foundation about what it would cost to get our barn back in square. I'm kind of scared to know what that's going to be. It's hard to justify spending money on a structure you have no plans on using, but it's such a beautiful building it would be a shame not to care for it. Plus, can you really have a farm house with out a barn? When I painted our beadboard-ish cabinets, I used a brush for the grooves and then followed with a roller for the boards. That technique might work for you.